Michelle and Barack Obama’s troubling advice to black graduates includes some seriously worn-out stereotypes. 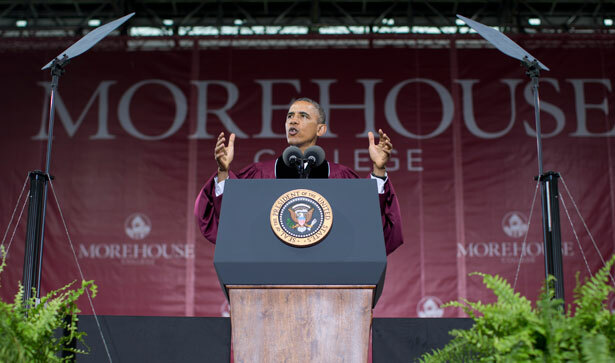 First lady Michelle Obama and President Barack Obama were the respective featured commencement speakers this year at Bowie State University and Morehouse College—two historically black colleges and universities (HBCUs) founded nearly 150 years ago. While the Obamas could have taken the opportunity to inspire black graduates entering an uncertain future, both chose, instead, to pepper their remarks with problematic and unobliging stereotypes about black youth. While doing so, both also conveniently neglected to call attention to the policy changes that President Obama could have enacted to help alleviate the insurmountable odds that young people of color—and blacks in particular—face in the United States. Michelle Obama’s banal descriptions come at a time when many of us are waiting with bated breath for the Supreme Court’s decision on affirmative action, which could reverse the positive—and still developing—results of Brown v. Board. Although the first lady pointed out that one in three black students drops out of high school, and that only one in five between the ages of 25 and 29 have a college degree, her remarks appear to put the onus not on a system designed to ensure black failure but on lazy individuals. Forget that Chicago Mayor and former White House Chief of Staff under Obama, Rahm Emanuel, is backing the closing more than fifty schools, which will disproportionately affect black students—as violence rages on and is literally killing black and Latino youth. Forget the ways in which Obama has made “painful cuts” to Pell Grants—benefits available to students whose families cannot otherwise afford to pay for college (read: black, brown and Native families who have fared worse under Obama, and can never seem to catch up to the wealth that white families have secured after centuries of inequities). Michelle Obama’s remarks reserve blame not for an entire structure that betrays black students at multiple levels, but on black students themselves whom she condemns for wasting time in front of television sets. The first lady’s remarks about black youth fantasizing about “being a baller or a rapper” might cut extraordinarily deep for those youth who essentially learn literary criticism by close readings of rap lyrics. Those youth are grasping rhyme, metaphor and syntax before the concepts are even introduced in their public school. And there is innately nothing wrong with—and, in fact, much to be celebrated about—the art of hip-hop, or learning to survive as a so-called baller when other avenues have systemically been closed to you. Perhaps more problematic were the president’s remarks to Morehouse graduates on Sunday—after all, perhaps the first lady can and should be spared the most egregious consequences of this administration’s decisions on communities of color. It will be Barack Obama, and not his better half, who will inherit the legacy of continued criminalization schemes that secure the inordinate number of blacks in jails and prisons, along with increased deportation schemes that secure a record number of immigrant removals. The outrageous bounty placed on Assata Shakur, the flawed use and defense of drone strikes that result in extrajudicial killings—these are some of the ways in which this president will inevitably be remembered. During his address, the president, too, evoked Dr. King, Thurgood Marshall and Fredrick Douglass, and included personal observations such as the times when he used to write off his “own failings as just another example of the world trying to keep a black man down.” But that conviction was swayed after learning that “there’s no longer any room for excuses.” While Barack acknowledged the legacies of slavery and segregation, and the continued practices of racism and discrimination, he stressed the need to overcome these barriers because of an increasingly competitive global market in which “nobody is going to give [black graduates] anything that [they] have not earned.” He could have added that even earned rewards can quickly evaporate once race mediates the situation. Like his partner, the president stressed individual responsibility—dangerous and impractical guidance at a time when an undying system of white supremacy continues to dictate not only access to wealth and education, but also continues to determine matters of life and death. Graduation is often a time for inspiration, not attacks—although that may have been lost on the first couple. Still, neither Michelle Obama nor Barack Obama could possibly fail to grasp that their words echo beyond commencement services and to audiences far and wide. In that respect, the speeches they’ve shared were written for all of us, and perhaps for black youth in especially, who are at once being bombarded with insulting stereotypes, and being blamed for a reality they haven’t constructed or can easily benefit from. As the president is being rocked by a right-wing-manufactured scandal, he might consider searching for support from the imaginative movements that helped bring him to power—movements that recognize that it’s not black people who are failing to succeed, but that a long-entrenched power structure fails to fully recognize the value of its entire people. The Obama adminstration could take executive action to ensure better jobs for workers paid by government contracts and subsidies. Read Josh Eidelson’s report on today’s strike action.